TechnoFile reviews Reference Recordings' "Horns for the Holidays"
"Merry Christmas, y'all!" — Gigi Sherrell Norwood, Director of Education and Concert Operations, Dallas Wind Symphony. So end the entertaining liner notes to "Horns for the Holidays," a new HDCD release from Reference Recordings. The notes kind of put into perspective the Texan view of Christmas, a time of year when people in other climes are steeling themselves for cold and snow, stuff more amenable to the annual sleigh ride of St. Nick than the very warm areas where snow rarely appears. The music, however, doesn't really care if the weather outside is frightful, and the music here is quite delightful. The recording quality, too, for the most part. And, since it's a wind symphony, it's all performed for your enjoyment with no strings attached! Well, there is a string bass, but other than that, the Symphony – as its name implies – features woodwind and brass instruments, backed up by a percussion section and, on a few tracks, the lush tones of the Morton H. Meyerson Symphony Center's Fisk pipe organ. As much as I love a full symphony, the exclusion of the string section helps give these tunes a sound different from what you'd get from such other "more inclusive" and traditional orchestra recordings such as you might get from the Boston Pops or other such symphony orchestras. 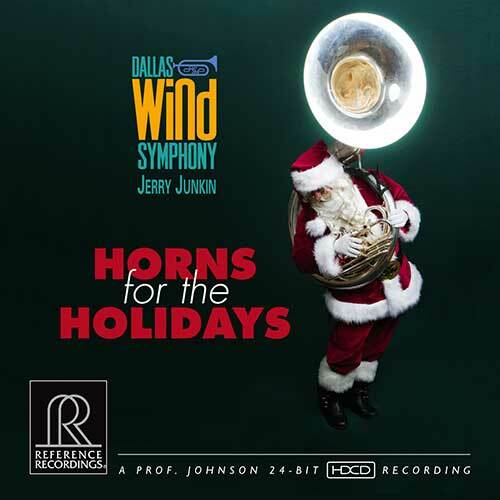 Horns for the Holidays was conducted by Jerry F. Junkin, the Dallas Wind Symphony's Artistic Director, and is full of fantastic arrangements and excellent performances of a variety of Christmas standards, blended with some pretty neat original compositions and arrangements specific to this orchestra. For example, the opening track – John Wasson's "Festival Fanfare" – was commissioned specifically by the Symphony, according to the liner notes, while "Minor Alterations," by the orchestra's own David Lovrien (he's also one of the alto saxophonists), is an intriguing "original work" that puts a very interesting spin on traditional Christmas themes. Some of it reminded me a bit of Danny Elfman's fantastic score to "The Nightmare Before Christmas," though it doesn't use that soundtrack at all – it's just kind of reminiscent. This is apparently the first holiday music recording the Dallas Wind Symphony, and its 12 tracks include such standards as "I'll be Home for Christmas," "the Christmas Song (Chestnuts roasting)," "Have Yourself a Merry Little Christmas" and "Deck the Halls." But while anyone (well, anyone who does such things) can do yet another version of Christmas standards – not to minimize how great these arrangements and performances are – what I found really rewarding were the more unusual entries, such as the abovementioned "Minor Alterations" as well as the unusual "Jingle Bell Fantasy" and the closing "Christmas and Sousa Forever." The latter is a fascinating blend of holiday music and march king John Philip Sousa, as if the two were dumped into a "music processor" and puréed into a new form. It's very cool. The disc was recorded in mid-August of 2011, engineered by "Professor" Keith O. Johnson and recorded by Sean Royce Martin. Reference Recordings has released the disc on the 24-bit HDCD "high definition compatible digital" format, which Wikipedia says was co-developed by the "professor" and debuted in the mid-1990's. HDCD's are said to increase a recording's dynamic range (defined on ehow.com as "the ratio of the loudest to faintest sounds that can be reproduced without distortion") over that of standard audio CD's, and are backward compatible with conventional, non-HDCD compliant CD players. Whether HDCD's sound is better than what you can get from a conventional CD depends on many factors – the old "garbage in, garbage out" syndrome definitely comes into play – but in general, the HDCD's I've heard have sounded excellent. I prefer the even higher quality of SACD and DVD-Audio discs – with the same "GIGO" caveat – but in general HDCD is worth having. It's unfortunate that it (and the other formats cited here) has only achieved limited market penetration. I've listened to other Reference Recording releases on both SACD and HDCD, though only a few of them have come my way, and the label does a fine job of bringing recorded music to the home with excellent fidelity. I have a bit of angst about Horns for the Holidays, however. While the recording is very dynamic and the symphony sounds great, the recording sounds a little "distant" to my ears, almost as if they set up the microphones in a different room from where the music was being performed. It's hard to really put my finger on it, because the sound is still very good – and I'm more of an audiophile consumer than a technical person so perhaps I lack the vocabulary. But it just didn't sound as "live" as I had expected and hoped for. Still, my angst about the title isn't enough for me to not recommend it. I played it on three different audio systems, including my highest end, 500 watt per channel Rotel/Definitive Technology system, a 250 watt per channel Rotel/JBL system and even the much more mainstream Bose SoundDock 10. All the players I used were by Oppo, including their fantastic, top line BDP-95 universal audiophile Blu-ray player. So while it may be my ears that aren't hearing the disc properly, it ain't the equipment. I asked Reference Recordings about this, though I don't think I did a great job of expressing my concern because their response suggested that I'd been playing the disc too loudly and that maybe I should visit some local high end audio dealers to play it on what I presume they meant as "real" high end equipment. Yet other discs sound fine. Besides, in my experience, the higher end the system is the more it magnifies flaws in a recorded source – though it can also reveal nuances you've never heard before, which is one of the great things about high end audio (and undoubtedly what the Reference Recording folks were getting at). This is one reason why audiophiles keep updating their libraries when new and better formats come along – or when they upgrade their equipment. And it's much to the delight of the software makers, I'm sure! I've lost count of how many times I've replaced my "record" library – and don't get me started on my movie collection! Or my hardware! It's like being on a merry-go-round. Anyway, Horns for the Holidays still sounds better than most CD's I've heard so, while my issues with the audio are undoubtedly nit picking in the grand scheme of things, I was still mildly disappointed and must report that to you. And it's still one of the best Christmas albums I've played and will feature prominently in my home's Christmas music from now on.